THIS ITEM IS COLLECT ONLY. ( ITEM IS HUDDERSFIELD AREA WEST YORKS ). Very heavy duty. Extra foam can be added it is easily available from local markets / Dunelm mill etc. Top to Bottom - 44 cm. 100% Original Genuine LIM'S. For Leica Q. As much as you use the case, it will be glossy and you will see a unique character from the leather. - 9.8mm thickness whole aluminum is applied for maintaining flatness and it gives simple design & luxurious feeling. 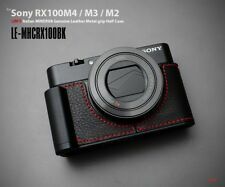 Compatible Model : Sony RX100 II III IV V ( M2 M3 M4 M5 ). As much as you use the case, it will be glossy and you will see unique character from the leather. - 9.8mm thickness whole aluminum is applied for maintaining flatness and it gives simple design & luxurious feeling. 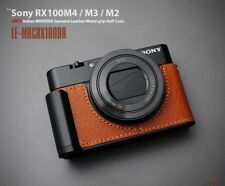 For Sony RX1R2 RX1RII RX1RM2. 100% Original Genuine LIM'S. As much as you use the case, it will be glossy and you will see a unique character from the leather. 9.8mm thickness whole aluminum is applied for maintaining flatness and it gives simple design & luxurious feeling. Manufacturer: ULTRASPORT. -precisely with all snippets Ultrasport secure guard without the capabilities to interfere with. Marke Ultrasport. Markenkompatibilität Ultrasport. -Color housing: black/matt. Compatible Product Line F128. Water-resistant Red EVA Hard Case for iOTA One limatt70(11). Also includes a carabiner which allows you to attach the case to your belt for easy transportation and ease of use. Material: nylon / synthetic / leather. Nice retro look in light brown color with leather finishings. Color: light brown. We will do our best to resolve any issues swiftly. All-aluminum CNC precision molding production process, the appearance of sandblasted anodized crash problem can be solved in the process of filming due to heat caused. Casey is the perfect GoPro travel and storage solution. The water-resistant, semi-rigid shell guards against light rain and snow. Includes a pull-out pouch for smaller grab-and-go accessories like batteries, thumb screws, microSD cards and more. 1X(Aluminum Alloy CNC Case for GoPro HERO 6/HERO(2018). Small window design allow you to connect cables and popping out SD card. It also can protect from accident, bump and others. Material: aluminum alloy. ). 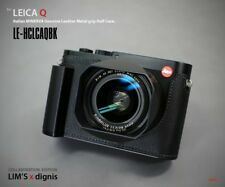 Compatibled with Canon, Nikon, Sony and other lenses. because of insulation rubber layer. A is waterproof and elasticity frabic. B is SBR, shockprooof and lightweight. C is super soft flannelette, won't lose color and unscented. Quick access through the top of the bag by simply opening a zipper. And it can be easily carried with the shoulder strap and or the hand carrying strap. includes: 1x Mantona Neolit I Photo Bag. Item model number: 270035. Nice metal case filled with vintage camera accessories. As found. GOOD: 80-89% of original condition - shows moderate wear for the age of the item. AS-IS: sold as found, unchecked - see pictures. unknown - sold as found - untested. unknown - item has not been tested, might be in fully working order, but is sold as found - for parts / defective.